A renovated 19th century gem, the Cardinal Point Farmhouse is located in Afton, VA, and has impressive and unimpeded views of the Blue Ridge Mountains. 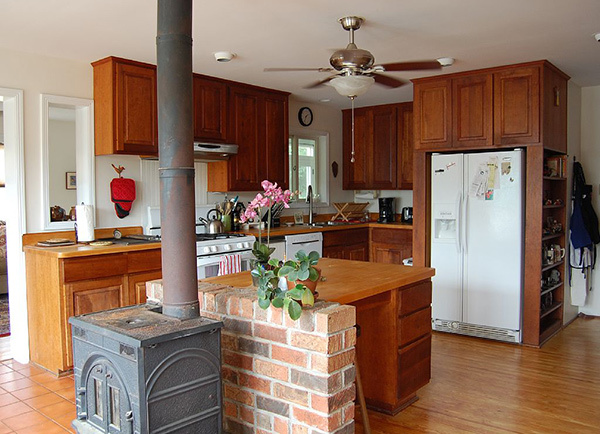 This five bedroom historic farmhouse is located among the vineyards of Cardinal Point Winery and is conveniently located near several other wineries, breweries, a cidery and a distillery. Stunning views of the Blue Ridge mountains abound, from the house, and especially from the pool. Enjoy relaxing with a book on our screened side porch, on the front porch swing or in the hammock. We hope you’ll find our family home a welcome retreat from your daily grind. The house has five bedrooms, three full bathrooms and sleeps ten guests. A large, bright kitchen area filled with natural light, complete with a built-in bench along the wall, makes entertaining while cooking a breeze. The kitchen has custom cherry cabinets, butcher block countertops and is designed with the amateur chef in mind. There is a double sink, a gas stove, two ovens, dishwasher, side-by-side refrigerator with an ice and water dispenser, a wine refrigerator and a bar sink. Appliances also include a blender, toaster, coffee maker, food processor, hand blender, microwave, and standing mixer. If you love to cook and entertain, this is a beautiful kitchen.